The state government of Telangana, has announced of supplying electricity to the farmers in the state, Free of cost. According to the new statements made the government aims at providing farmers with uninterrupted 24×7 electricity supply for their farm lands. To ensure that the facility is not being misused, the state government and electricity board will take all possible steps and measures. The new scheme was officially launched by Mr. Raghuma Reddy (MD – Southern Discom) and D Prabhakar Rao (MD & Chair Person – TCTL (Transmission Corporation of Telangana Ltd.). The latest launch was officially done after the approval from the CM of the state K Chandresekhar Rao at noon on 1st January 2018 while addressing a meeting at Medchal Malkajgiri District – Shamipet mandal (Pothaipali Village). 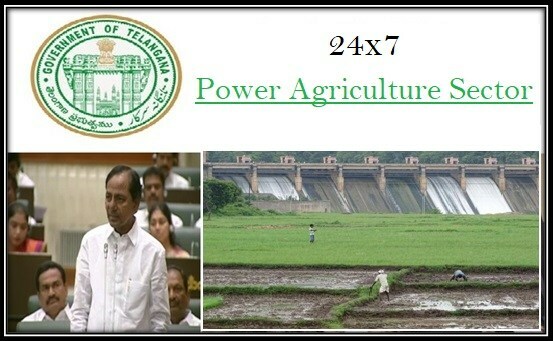 According to the latest updates from the state government, the people in the state will be offered an access to 24 x 7 electricity supply if they are related to any activities that is linked with agriculture. The uninterrupted power supply will be offered as a free gift to the state farmers so they may not have to face losses on account of power shortage supply. The CM also stated that as compare to other states, the farmer in Telangana state will be provided with 24×7 electricity for free while all other stats are providing free electricity only for few hours to the farmers. The state farmers can make use of the electricity supply for running their water irrigational pumps in their farmers so the lands can get water supply for irrigation of crops. The state government has also ensured that with the present available system for electrification, the state government is in a condition of providing with over 17,000 MW of electricity where as the current requirement is only of 11000 MW for agricultural sector. The state government has also made it very clear that over the past three years the government has invested around Rs 12610 crore in the electrical sector to help improve the production. As the state does not have sufficient canal system for irrigation so the state farmers have to depend a lot on the functional electrical pumps for water supply. With the state receiving uninterrupted 24 x 7 power supply, this factor is believed to benefit the entire agricultural sector within the state. It is also expected that with new implementation farmers will be able to benefit maximum from ground water resource.